Through products such as the new SmartSSD, QLC-SSD, 256GB 3DS RDIMM and High Bandwidth Memory 2 Aquabolt, Samsung enables the most advanced providers of server-less computing. There products aim to allow datacenter operations to scale quicker while saving costs by accelerating data processing, bypassing server CPU limits and reducing power demands. Something wrong with the story link. I'm trying to access the story from here, because the pop-up thing on the front page happens before I can click on a story link there. I know ad rates are terrible today. But that front-page popup is majorly annoying. The link is broken, will fix. What ad are you talking about? We don’t run pop ups. OK, not an ad. Upon closer look, it's an email newsletter signup. Which pops up whenever your cursor leaves the page, or moves a significant amount on it. Like towards another tab, or towards a story link on the page itself. Once it pops up, it dims the rest of the page, and covers it. 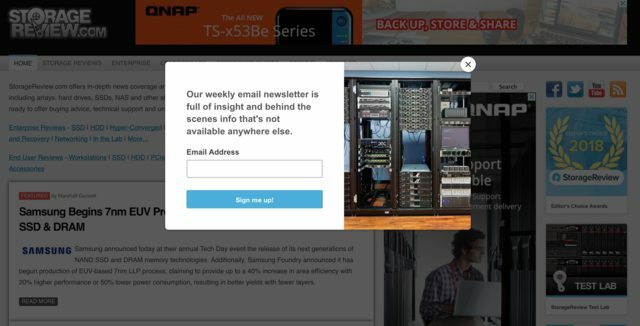 Clicking on links does not work until/unless you dismiss the popup. form action="//mc.us10.list-manage.com/subscribe/form-post?u=047b32e7f58e3630278c76a7f&amp;id=9faf3094f5&amp;popup=true" accept-charset="UTF-8" method="post" enctype="multipart/form-data" data-dojo-attach-point="formNode" novalidate=""
Edit: it appears on the SR story page too. At least the page can be scrolled under it, and read around the banner. Personally, I try not to click on popups, because it can lead to unexpected results. Yeah, sorry that's ours. Unfortunately the little bugger has been extraordinarily effective at getting newsletter subs while all other methods have lagged exponentially. I'll see if we can fongufre some reprieve for those who have seen it recently or for those who have subscribed. I don't get it for some reason, I presumed it was because I closed the box once. Will investigate further. I've never dismissed it, that may be the problem. I suggest a more minimal edit: could you set it to appear only when the cursor leaves the page? So it does not appear when mousing around story links, and getting familiar with SR's content.